We just got word yesterday, that one of the groups involved with filing lawsuit against F&G has backed out on that, and are also urging F&G to reconsider the steelhead closure. That article here! IRU backs out of lawsuit. The other groups involved in the threats of litigation again are Conservation Angler, Wild Fish Conservancy, Friends of the Clearwater, Snake River Waterkeeper, Wild Salmon Rivers and the Wild Fish Conservancy. We hope some good news continues on this front, and the others will back out too. But in the meantime, the contact information for our senators and congressman is included below again for anyone that wants to write letters urging them to help with getting the permits pushed forward and passed with NOAA, as well as the NOAA contact and a sample letter below. Also, want to reiterate again for all of our Women With Bait participants, that we will still be continuing with Women With Bait! We have other options and ideas in the works regardless of the steelhead season outcome for those of you ladies that still want to come up for a girls weekend away, fish, and experience our rivers! But, we are also not giving up on our steelhead tournament at this time, and we don’t want you to either! Thank you all so much for your support, we appreciate it greatly!! Once again Idaho’s public lands and natural resources are being managed by threat of lawsuit rather than by sensible Idahoans sitting around a table and determining our future and the future of our natural resources. I am calling on you as part of Idaho’s congressional delegation to step-in to help reinstate Idaho’s full fishing season. The Idaho Fish and Game Commission voted last week to suspend the steelhead fishing season until a permit can be obtained from NOAA Fisheries. The state agency was forced into the unprecedented situation to protect the Idaho taxpayer from paying frivolous legal fees to Idaho Rivers United who threatened lawsuit. There is plenty of blame to go around, but while these groups fire off lawsuits, Idaho’s rural communities, Idahoans who love to fish and the businesses that form the basis of our local economy are caught in the crossfire. 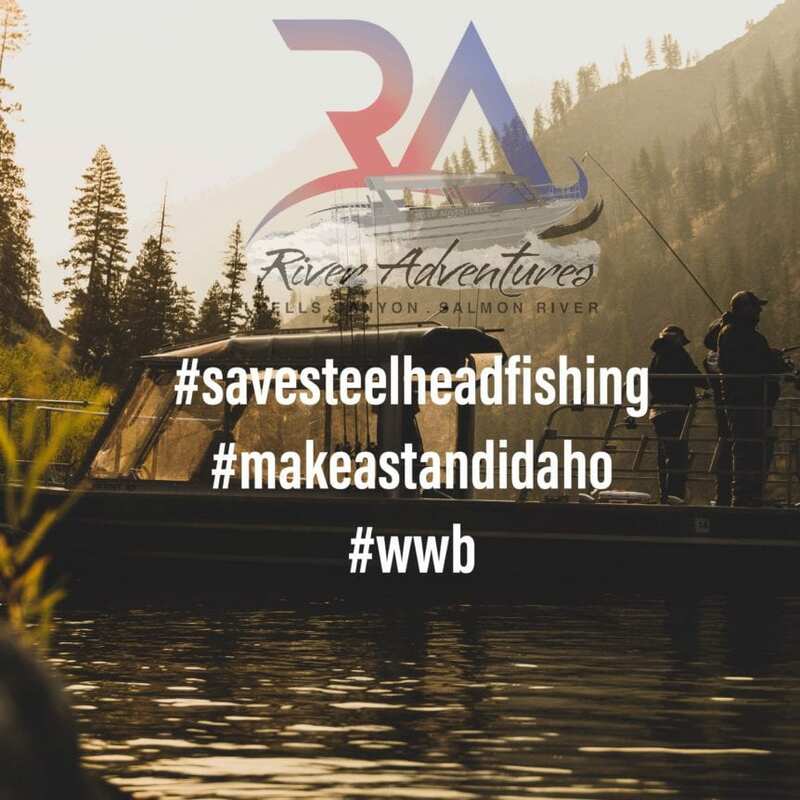 I want to be a part of the steelhead conservation solution, but lawsuits that shut down Idaho’s recreation industry are not the answer. We need your leadership. Please step in and press NOAA Fisheries to complete this long overdue permit immediately so Idaho Fish and Game can reinstate Idaho’s full fishing season. Our economy depends on your action as well as Idaho’s sustainable fishery. My name is David Jones, I live in Boise. My oldest son Kyle is a full time fishing guide ‘based in Deary, Idaho, working under Reel time fishing on the Clearwater during the steelhead season. I have been very active here in Boise, with emails, phone conversations and leaving messages to our Fish and Game along with 4 of the groups involved in the threat of a lawsuit. I hope my activity has help , I know it did with my one hour conversation with Kevin Lewis of Idaho Rivers United. I am very please to see the guide and river community come together to stand up for all of our steelhead fishing opportunities but we need to stay together. I would like to volunteer to head up a chapter in Boise so we can keep this momentum going forward for the next curve ball that we all know will come. Please feel free to contact me.